Dr. Chan joined NTU as a Lecturer in 1991 after obtaining his PhD and subsequently working as a postdoctoral researcher at Imperial College London. He is now a Full Professor in the School of Mechanical & Aerospace Engineering (MAE). He is concurrently holding 2 appointments as the Co-Director of the Energy Research Institute at NTU (ERI@N), and the Deputy Director of Maritime Institute at NTU (MI@NTU). 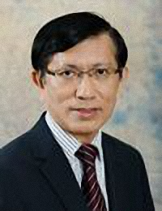 He is also a Non-Executive Director of Maz Energy Pte Ltd, where he provides technical advices to the Board since 2004. Funded by Royal Armament Research and Development Establishment (RARDE, UK), Dr. Chan’s PhD and post-doctoral research was inclined to Heavy-Duty Internal Combustion Engines for military application. He then extended his research interest to Fuel Cell and Fuel Reforming since 1997. He is the Organizer and Program Chair of the 1st World Hydrogen Technologies Convention (WHTC), Singapore and an active promoter and advocate of Hydrogen Economy in Singapore. From April 2006 till March 2008, he held a joint appointment with A*Star as Programme Director of SERC Fuel Cell Programme. Under this appointment, he led a team of more than 100 researchers from 4 A*Star research institutes working closely with industries on fuel cells. His research has gained him a number of international recognition. In 2000, he received the prestigious George-Stephenson Award from the Institution of Mechanical Engineers, UK (IMechE, UK) for his research in Automotive Engineering. This award is to memorize Sir George Stephenson (1781 – 1848), the Father of Railways, who built the first public railway line in the world using steam locomotives. In 2007, he received the Scientific Achievement Award in the field of Hydrogen Treatment of Materials and the Great Activities in the World Hydrogen Movement, awarded by International Association for Hydrogen Energy, USA (IAHE, USA). He was the only reviewer, outside of UK, invited by UK Energy Research Centre (UKERC) to comment on the UK National Fuel Cells Roadmap. He is the editorial board member of “Fuel Cells – from fundamentals to systems” and also “Journal of Power Technologies”. Dr. Chan is also a member of Management Board of Energy Studies Institute as well as a member of Advisory Board of Horizon Fuel Cell Technologies. He has published 190 refereed journal papers with total citations of more than 6000 and h-index of 41. He owns a number of patents in fuel cells and hydrogen technology. He is the recipient of “World’s Most Influential Scientific Minds 2014” Award by Thomson Reuters. His research achievements are also matched with his competency in teaching. In 2000, Dr. Chan received the Teacher-of-the-Year Award, NTU; the year he taught Thermodynamics.